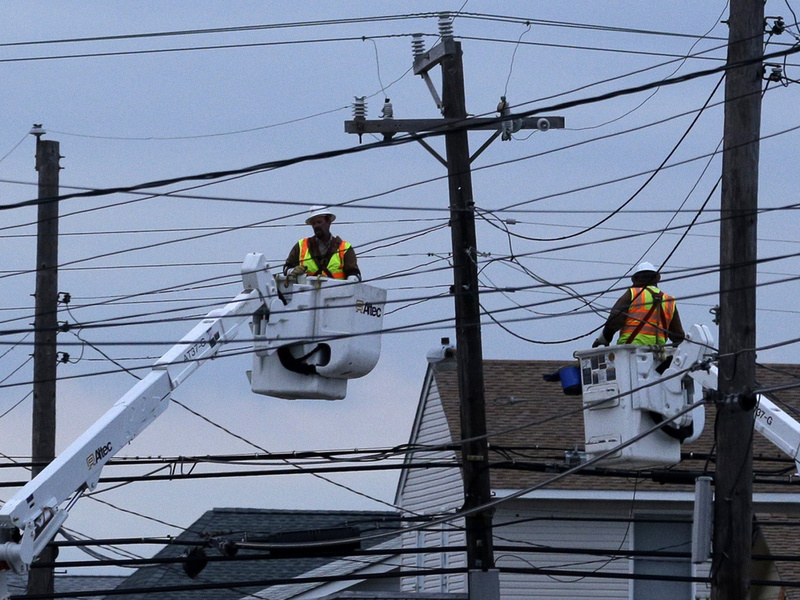 Utility crews work on power lines in response to Superstorm Sandy as dusk falls in Ship Bottom, a community on Long Beach Island, N.J. There are 2.5 million people across N.J. still waiting for power. Scott Hallamin of PSE&G works with his crew to restore power on Montclair Avenue in Nutley, N.J.
More than eight million people lost power after Superstorm Sandy. Five days later, two and a half million are still waiting as officials at power companies across the region continue to say that restoring power is more complicated than it seems. The storm packed a one-two punch. First, it flooded several switching stations including one hidden under the New Jersey Turnpike in Newark, says Art Torticelli. He was out with his crew from Public Service Electric and Gas (PSE&G) at a switching station in Essex. "The water level that rose was about to the top of the fence line here," he says, pointing to debris stuck to the fence at about six feet high. The station was shut down during the storm, but water still got inside circuit breakers and other components. Toricelli uses a number of cleaning tools, including a small wire brush about the size of a toothbrush. He says that every one of the wires has to be taken off and thoroughly cleaned, dried and reattached. "So that's what we're doing now," he says. These switching stations send power to substations, which in turn deliver it to homes and businesses. This particular station in Essex supplies power to 30,000 residential customers and a number of industrial ones. Meanwhile, in Nutley, N.J., in the second of that two-part punch, bucket trucks arrived on Montclair Avenue late Friday to clear trees that fell on power lines, driving them into the ground. PSE&G supervisor, Scott Hallamin outlined the damage with his crew. 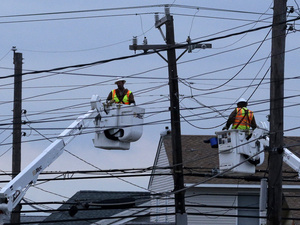 "Everything's down," he says about the power, but new poles were up and, after four days without power on Montclair Avenue, Hallamin's crew was there to connect the wires. Two local residents, Ro and Joe Labate, watched with anticipation on the brisk evening, thankful for their power to be restored, and wishing they could do a bit more, "I would make them coffee if I could. There's too many of them, though," says Ro Labate. Hallamin says he hears complaints, but he understands that customers don't see the total picture. That is, how crews have to clear debris, check each line and work block-by-block to get the grids back up. He adds, "All these residents will see is this part. 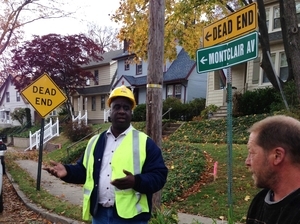 All they know is Montclair Avenue." Hallamin says crews have been working 16-hour shifts since the storm hit, even with an extra 2,000 workers from outside the area to help. "They might see us sitting for awhile, but we're waiting for a circuit or waiting for a tree crew, or something happened to the truck like we have a flat tire like we did yesterday. So, you've got to explain it to them," he said. Theresa Mercado lives on this block, and she knows this storm was unprecedented. Still, she says crews took too long to get here, "It just seems so slow, and thank God that the utility service is out today." Mercado says the utilities weren't prepared for this kind of damage, but Hallamin says there's not much more they can do, "I work for the company and I'm out of power. I know their pain, but what are you going to do?" he says. Around 10 o'clock last night, Mercado and the others on this block got their power back. PSG&E say they have restored service to more than 1 million customers, but 600,000 are still without power.